Who were the principals at HSS? There are many stories of early school days in Houston. These began in 1916 when the first teacher Miss McKay and the first students Bill and Maisie Dungate, and Ted, George, Dave, Jim, and Kathy Reynolds took their places in the desks nailed to long 2 by 4s on the floor of the first schoolhouse. There are stories of riding horseback from Knockholt through the forest to get to class, of older boys carrying guns to ward off and often take advantage of wildlife along the trail to school. There are tales of frozen lunches in lard pails, of frozen inkwells, of trips to the outside privy in forty below weather, and of drying wet mittens around the big iron stove. There are stories of the gala Christmas concerts by which the schoolteacher was judged, of the arrival of a large group of students who could speak only Dutch, and of the annual school picnic held in June along an often swollen Buck Creek. The first little log school was built as a community effort in Houston in 1916. Harry Davis, an early resident and school trustee of this area, donated several acres of land for a school, located approximately where the community hall is situated in 1998. George Dungate and Andrew Martinson were among those who cut logs and dovetailed them by hand and put up the building. The school housed a wood heater, teacher's desk, several rows of students’ desks, a large book cupboard, and a coat rack. The school was equipped with blackboards, a large clock on wall, maps on rollers, and a world globe and brass bell sat on the teacher's desk. At the back of the room a bench held a bucket of water and a wash basin. The dipper hung on the wall above. Back Row L-R: Jim Reynolds, Maude Davies, Chauncy Phillips, Bill Dungate, Queenie Phillips, Maisie Dungate. In 1931 a new, larger school was built across the road from the little log school, approximately where Silverthorne Elementary School is now. In November 1949, after two more classrooms and a playroom had been added, the older part of the Houston school burned down; later to be rebuilt. In 1952 another fire destroyed the rest of the school. 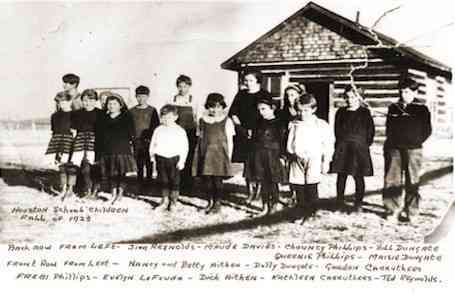 Classes resumed in the little old log school of 1916 that still stood beside the community hall while yet another building program took place. Around 1954, grade eleven was added, followed by grade 12 in 1955. In 1954 the Houston Superior School was officially named Silverthorne School, in honour of Harold Silverthorne who for so many years had served as school board secretary. John Hayhurst became the school principal in 1958, moving into the prefab teacherage beside the school. The school consisted of four rooms on the front and two on the back, plus a prefab out in the lot where Peter Penner spent his first year teaching. 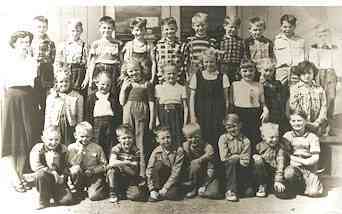 The Silverthorne School Class around 1955 with Miss Le Gros. Back Row L-R: Laurrie Humes, Keith Forsyth, Herbie Glaim, Norman Groot, Juan Andersen, Arthur Groot, Andy Meints, Tom Euverman, Ken Haftner, Jerry Westgarde. Middle Row L-R:Jean Seinen, Roberta Gerow, Dorothy Ruiter, Sonja Hofsink, Diane Meints, Mary Ann Ruiter, Mary Jean Mackenzie, Hilda Johnson. Front Row L-R:Eugene Lund, Johnny Kool, Bill Sullivan, unidentified, Otto Hagman, Ben Hofsink, Andrew Barendregt, Keith Bennett. With the arrival of the Hollanders, there was suddenly a need for more classroom space. The Barrett School, with an adjacent teacherage, was built on the highway about five miles west of Houston, across from what later became Eichenberger Road. The only record of this school is a register for 1940 which lists 16 students taught by Molly Holmes. Around 1950 the following students attended the Barrett School: Jean Stad, Evelyn Prins (Jaarsma), Lucy Seinen (Lieuwen), Mildred Demque, Jean Prins, Myrtle Demque, Clarence Stad, Harry Vlaar, Ralph Seinen, and George Stad. The Barrett School closed in 1951, and the students were transferred to Houston. The school building was moved to Quick, where it served as a school for many years, and today is used as an outbuilding on a farm in Walcott. In 1962 a second school began operating in Houston. In September of that year 47 children in Grades 1 through 7 and two teachers, principal Don Van Polen and Reta Vander Kwaak (Veenstra), began teaching classes in the Christian Reformed Church basement. The construction of a four classroom school followed, with the move to new facilities by 61 students taking place in January 1964. Population explosion By 1969 Houston was booming with the advent of a new lumber mill. In September Silverthorne School principal Kieran O'Neill called a meeting to discuss space problems: if a planned addition was not completed soon, students would have to attend classes in shifts. It did come to that: students went to school in shifts and shared classroom space. Eventually, a state-of-the-art new high school was planned. The new Houston Senior Secondary School was opened in February 1971, with Kieran O'Neill as principal. By 1971 there were 650 students enrolled in Houston public schools. In 1978, Bill Arkinstall was chosen out of 16 applicants to become the principal of Houston Secondary. Arkinstall held this post, with a few years off here and there, until 1998. 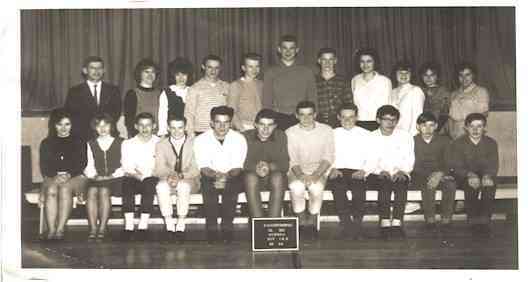 Silverthorne Class of 1965/66 with teach Mr. Doug Parry. Growth in Houston continued and so did the need for classroom space. In February 1976 plans were drawn up for a new elementary school to be constructed next to the new high school. The school was dedicated to and named after long-time school trustee Twain Sullivan, and officially opened on October 28, 1977, with Bob MacLean as the first principal. In June 1981 the schools in Houston were full to capacity. HSS had 425 students, and Silverthorne had 400. Twain Sullivan Elementary, with an enrolment of 312, was bursting at the seams, and an addition of six classrooms plus a gym expansion was completed there in March, 1982. The Houston Christian School also expanded in 1981, adding Grades 9 and 10. By then the school had 75 students. A grand opening of a new wing that included a gym and several classrooms was held on June 25, 1982, coinciding with the 20th anniversary of the school's operation. Total student enrolment in Houston in 1982 was 1212.
Who were the principals at Houston Secondary School?